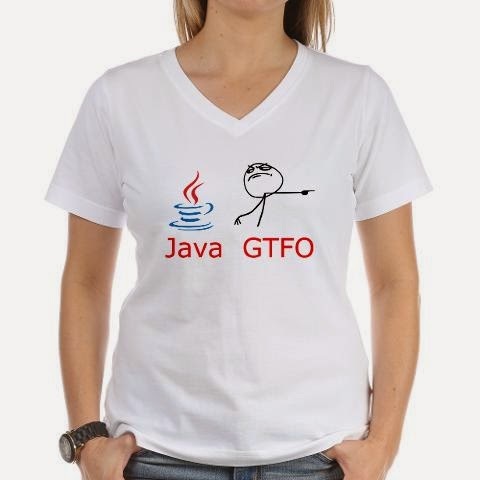 For when you need to exorcise the evil spirit of java from a computer. The power of security compels you! This is, of course, taken from a rage comic I made in response to a tweet from Lysa Myers a while back. I don't know if CafePress or Zazzle will allow this design to stay in their stores, but we'll never know unless we try. If both stores ban the design I'll just include the actual images here for people to make their own items ad-hoc. I don't think either store prevents that. As always, the CafePress mark-up is 0% and the Zazzle mark-up is 5% (because it won't let me go any lower).